Of course the phrase “never before available on DVD” sounds more impressive when augmented by “…and also never available on VHS,” but such a pronounced lack of platform accessibility kinda begs the question: is it possible the reason the movie under discussion has been sooooo out of circulation is that, um, it's just no good? Yet for fans of George Pal’s 1962 sci-fi/adventure masterwork The Hollow Earth—fans who are now admittedly getting a bit long in the tooth—this question never arises. They know it’s really just the feuding of corporate legal departments (in this case Disney and Turner/Warner Brothers and MGM) that are to blame, with the upshot being that their beloved film has been out of theatrical release since 1977 and off the television airwaves since 1981. So to them it seems understandably miraculous that, as of this week, pristine versions of The Hollow Earth are out on both DVD and Blu-ray courtesy of Shout! Factory, and there are even rumors of a limited big screen run from Drafthouse Films. Sure, the timing could have been a tad better since a 2012 release would have coincided with the 50th Anniversary, but you can’t have everything and frankly, it was enough last year just to savor the home video announcement. 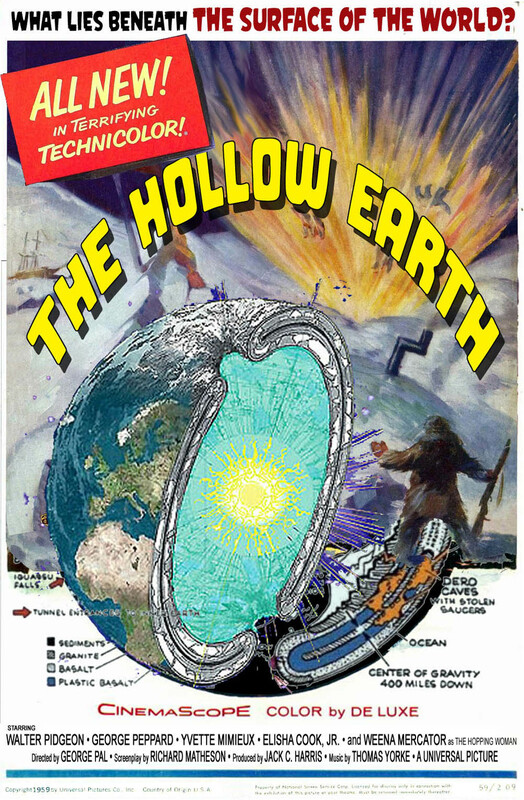 Oh, and in case you couldn’t tell, I’m one of those long-time, and long-suffering, fans of The Hollow Earth. As if in acknowledgement of us, Shout! Factory has included three separate fan-focused extras among the DVD and Blu-ray goodies (they’re the same in both formats). One is an interesting 20-minute featurette on the fan clubs and gatherings around the U.S. and Canada (and even two in the UK and one in Mexico) that kept the film culturally alive over the years. Another featurette spotlights fan-made media artifacts that have helped introduce the story to others who've had no exposure to the actual film--these include stage plays, puppet shows, radio dramas, and YouTube "remakes." Finally, there’s even a photo gallery of bootleg copies of the film, something I’ve never seen before on a home video release. Of course the photo galley of Pal posing with both his astounding miniatures and his equally impressive cast will reminds us why The Hollow Earth has enjoyed such a fan following in the first place. Rounding out the package are the theatrical trailer and, most satisfying of all, a commentary track by star Yvette Mimieux in conversation with legendary critic Phil Hardy. Dismissed at the time of its release as aping the popular Journey to the Center of the Earth (1959)—largely, it seems, because of the simpleminded observation that the two titles share the word “earth”—The Hollow Earth is the quintessential "overlooked gem." In truth, one could not imagine more different sensibilities than Henry Levin's in the former and Pal's in the latter. As just one example, instead of the hokey live-action giant iguanas in Journey, we have the genuinely startling pack of ice creatures, a typically innovative stop-action creation from the director. Yet while the visual effects throughout are eye-popping, it is the powerful character development and nuanced storytelling that distinguishes The Hollow Earth from its genre brethren. Understandably, these elements did not resonate much with thirteen-year-olds in the early ‘60s, who probably expected a higher dosage of fistfights, tentacles and explosions in their matinee fare. Indeed, the film is far more psychological in intention than one might expect, a factor in its brief popularity in revival houses in the late ‘70s and early ‘80s. In fact, it was this belated recognition that led to Disney’s purchase of the rights to the picture for the purpose of developing an animated version. Needless to say, that version never got produced, and an unintended byproduct was that the film was taken out of distribution, much to the annoyance of the original studio, MGM, and the subsequent theatrical/TV distributor, Warner Brothers. The sophistication of Richard Matheson’s script is evident on levels of both text and subtext. George Peppard as the young but avaricious backer of the voyage, Steven Shepherd, and Pidgeon, the mature, science-for-science’s-sake figure, gradually come to trade roles. Pidgeon’ s idealism becomes obsessive even as Peppard, in one of his many underrated performances, grows more concerned with keeping people alive—at first to ensure his own safe return, but then increasingly out of genuine compassion. Thus the film's topsy-turvy metaphor shifts elegantly from the visual to the thematic. The loyalties of Mimieux’s navigator, Sasha, swing between Shepherd and Warner, but not with any explicitly romantic overtones, as one might expect from a standard Hollywood genre flick. “There’s no horizon line anymore,” she says, her blank face looking out on vista of white sea and white “sky,” although we know she is actually commenting on her inability to draw any clear lines of moral and metaphysical demarcation. It is at moments like this that the tone of the film feels more indebted to Ingmar Bergman than to Jules Verne. In fact, the movie undoubtedly featured far too many self-reflective episodes for audiences of its day (and perhaps for today’s as well! ): the subtly recurring figurative references to a “cold war”; the clinical exploration of the effects of “anti-magnetic” polarity on the human body and, we are led to believe, by extension, the mind; the cosmological ramblings of several crew members when the sky above disappears as they “turn the lip of the cup” (as Pidgeon puts it), and find themselves somehow still at sea; and the vaguely spiritual conceit present when, running low on both food and fresh water, the explorers find themselves mysteriously nourished by the rays of a subterranean aurora borealis. These scenes, and more like them, await discovery by a new generation of young moviegoers. The only problem is, you’ll have to be the one to break the news to them that a sequel to this winning film was never produced. Hey, but us fans have already experienced one miracle… maybe it’s not too much to ask for another?